WordPress Codex gives us nothing about update_core capability for WordPress user, except WordPress version of its appearing in the code – 3.0. I suppose according to its name, that update_core capability is used to decide, if user can update core WordPress file using built-in WordPress upgrade feature or not. What do you think? Thoughts are just thoughts, while they are not confirmed by practice and strong experiment. Thus, I decided to check this obviouse guess, satisfy my curiosity and investigate, how and for what purpose WordPress uses update_core capability really. Result of my little investigation will be shown to you below. update_core capability for WordPress user was found at 8 PHP files. WordPress really uses it to check if user has right to fulfil automatic update of WordPress itself. Additionally this capability is checked to decide if output notice to the user about WordPress core updates available. That’s it. Is it too short in order to be true? But that’s full information for update_core capability on the ordinal WordPress user level, even if he is WordPress admin. If you are WordPress developer or you are a curious person and has some knowledge of PHP, I have a lot of code phragments from WordPress core files for you, which illustrate how and with what purpose WordPress uses update_core user capability. 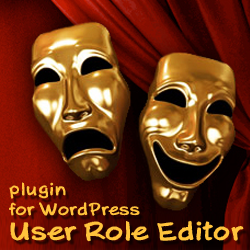 * Create and modify WordPress roles for WordPress 3.0. As commented at file header: “WordPress Administration Update API. The admin side of our 1.1 update system”. Other variants of this footer could be: “You are using a development version N.N.N. Cool! Please stay updated” or “Get Version N.N.N” with links to the correspondent core files update stuff. 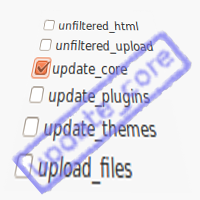 2nd, function update_nag() checks update_core capability and stops in user has not it under multi-site environment, or shows information about new WordPress version available with invitation to update for user with update_core capability and just notification without link for other users under single-site environment. As commented at file header: “Build Administration Menu”. Header comments for this file is: “Update Core administration panel”. update_core capability for WordPress user is checked here at very begin. If user has not such capability, execution of this script is stopped. // Fall through if not DISALLOW_FILE_EDIT. // Disallow anything that creates, deletes, or edits core, plugin, or theme files. // Files in uploads are excepted. Key moment WordPress develper should know – if constant “DISALLOW_FILE_MODS” is defined and it’s equal to 1 or true, then update_core capability will not work – map_meta_cap() returns ‘do_not_allow’ always in this case, inspite of the fact, that user has update_core capability or he has not. Thus, our little trip inside the dense forest of WordPress core source code is finished. This entry was posted on Sunday, August 5th, 2012 at 09:56	and is filed under General, WordPress, WordPress Capabilities. You can follow any responses to this entry through the RSS 2.0 feed. You can skip to the end and leave a response. Pinging is currently not allowed.